Rahm Emanuel Can Run For Chicago Mayor : It's All Politics Emanuel's eligibility for mayor was contested by some who said he didn't meet the residency test. 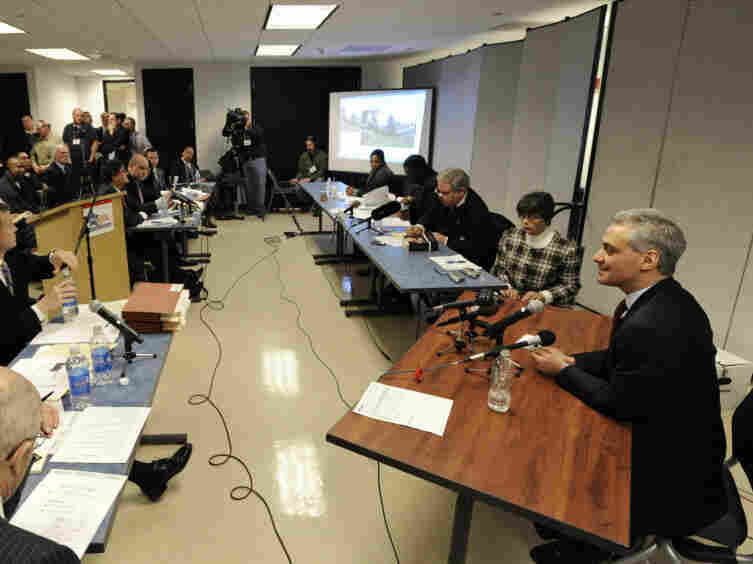 A hearing officer cast aside those challenges, saying that Emanuel didn't abandon his Chicago residency when he moved to Washington to work for Obama. Updated at 6:39 pm -- Following the board's decision, State Sen. James Meeks, senior pastor of a South Side megachurch, withdrew from the race, saying the city is "divided and cannot stand." He encouraged the other black candidates to withdraw, too. Updated at 12:52 pm -- It's official. The Chicago Board of Election Commissioners has approved a recommendation that Rahm Emanuel be allowed to run for mayor in the February primary. The board voted Thursday to accept it's hearing examiner's findings. The approval is not the final word since those opposed to the former Obama White House chief of staff's candidacy can still challenge his residency eligibility in the courts. If Rahm Emanuel doesn't become Chicago's next mayor, it appears it won't be because the city's Board of Election Commissioners got in his way. The board's hearing officer recommended that the panel allow the former Obama White House chief of staff's name to appear on the February primary ballot for mayor. That would mean rejecting numerous challenges to Emanuel's eligibility to run to be Chicago's chief executive based on questions about whether he met the city's eligibility requirements. "Prior to 2009, the Candidate was a resident of Chicago. The Candidate in 2009 and 2010 did not abandon his status as a resident of the Chicago, and so remained a resident of Chicago.... From January 2009 until Oct 1, 2010, the Candidate was largely absent from the City of Chicago and his absence was occasion(ed) by his attention to the business of the United States... The candidate satisfies the residency requirement... The name of Rahm Emanuel shall appear and shall be printed on the ballot for election to the office of Mayor of the City of Chicago to be voted for at the Municipal General Election to be held on Feb. 22, 2011." The recommendations are only that and don't have to be accepted by the three-member board. But such commissions usually rubberstamp such staff recommendations so it's likely a done deal. The board meets Thursday morning to review the recommendation.